…A fearless horsewoman who grew up just down the road from the Snowy, who beat the men at their own game. They breed them tough in those mountains, and Leigh Woodgate’s experiences have been epic. Do your people hesitate at hurdles? Do they struggle to get back on the horse after setbacks? Leigh might have the story and the old-fashioned, pigheadedness to help them overcome anything! Growing up, riding was her life. She was a natural rider and from a young age developed into a champion; a proud and proficient professional jockey. One race changed all that. She had a horrific fall, broadcast on national TV. With the racing world watching and fearing the worst, she survived, but it took her 15 years to repair her shattered body and mind – 15 years of perseverance and dedication – to get back on the horse, literally. Leigh’s spent the last 5 years riding track work, as well as sharing her story with corporate and community audiences. As Leigh says; I’ve harnessed this experience to share my story and inspire audiences around the world. The story of the only woman ever to win the Great Mountain Race at Mansfield, as well as countless other awards and accolades as a professional rider, is one of determination. The accident changed the course of her life forever. At the 2nd last jump my horse stumbled and fell. The rest of the field was unable to avoid my body on the track. The resultant injuries were almost fatal; hardly a bone in my body was left unbroken. Leigh was in a coma for 17 days, then in hospital for 6 months. The whole time she believed passionately that she would ride again. Leigh had to learn how to eat, talk and walk again. Step by step, she strengthened her body and her resolve. Leigh’s received great support overcoming profound hurdles. 15 years after her accident, she finally received clearance from doctors to ride again, which she does professionally 2 mornings a week for the trainer Eric Musgrove. 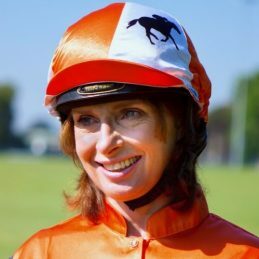 In 2012 she was recognized as the National Jockeys’ Celebration Day Ambassador, and was featured in an episode-long story on Australian Story. Leigh’s will and determination to get back on the horse have got her through daunting adversity, and she inspires others to overcome the obstacles they come up against in their own lives and careers. If you would like to see the impact Leigh’s story can have at your next conference or event please click to see her keynote.